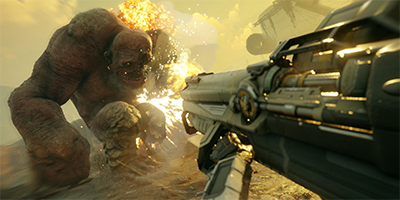 WELCOME TO THE SHOOTERVERSE: id Software’s shooter pedigree and Avalanche Studios’ open world prowess is dream-team-made-real for RAGE 2. It’s more than a shooter, more than an open world game – it’s a shooterverse. 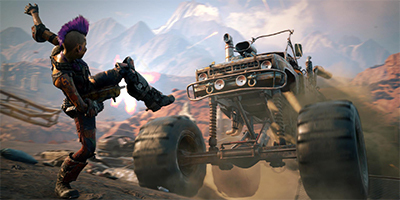 THE WASTELAND AWAITS: Seamlessly traverse a vast and varied landscape, from lush jungles and treacherous swamps to sun-scorched deserts in your pursuit of The Authority. The wasteland is massive, and you’ve got the arsenal to fight for every inch. 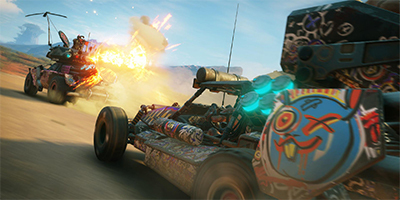 PEDAL TO THE METAL: From monster trucks to gyrocopters, use an assortment of rugged and wasteland-ready vehicles to speed across the badlands. If you see it, you can drive it. 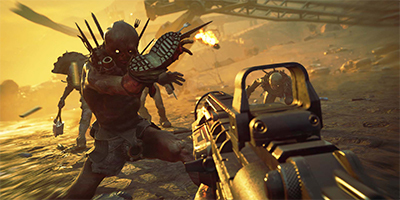 THE LAST RANGER: Bring the pain using a collection of upgradable weapons, devastating Nanotrite powers, and Overdrive, the ability to push your guns beyond their mechanical limits. FACTIONS & FOES:Fight against ferocious factions for control of the wasteland, each featuring a rogue’s gallery of madmen, mutants, and monsters hungry for blood.